I have another super easy, very basic cap for you today! The colour combinations for this one were chosen by my partner. I asked him to rummage in the stash and find some colours he liked and Id figure out something with them. Mmm great taste hun! So this is hat number 4 on my way to 100 for Angels for the Forgotten's charity challenge. If you want to stitch along you can find more details In this Facebook Group. This hat fits my hubby well, tho the back is slightly loose and I'll put that down to the fact that he shaves his head, and has no hair there to bulk it up. Of course you could make it smaller by using a smaller hook or not having as many increases. Yarn in 4 colours. I used cream (A), a greyish green (B), a brown/cream variegated (C) (camo works well) and a brown (D). needle to sew in ends. I carry the cream throughout, but the stripe colours I drop and cut at the end of each round, just so the inside is neater, but you can leave them all attached if that doesn't bother you. 1: ch3, dc in the 1st chain 10 times, join. 2: ch3, 2dc in each stitch around, join. 3: ch3, *2dc in the first stitch, dc in the next stitch* repeat around, join. 4: With colour B - ch2, *2hdc in the first stitch, hdc in the next stitch, spike in the next stitch* repeat around, join. 5: With colour C - ch2, *2hdc in the first stitch, hdc in the next 3 stitches* repeat around, join. 6: With colour D - ch2, *2hdc in the first stitch, hdc in the next 4 stitches* repeat around, join. 7: With colour A - ch3, *2dc in the first stitch, dc in the next 5 stitches* repeat around, join. 8-9: ch3, dc in each stitch around, join. 10: With colour B - ch2, hdc in the first 4 stitches, hdc spike in the next stitch* repeat around, join. 11: With colour C - ch2, hdc in each stitch around, join. 12: With colour D - ch2, hdc in each stitch around, join. 13: With colour A - ch3, dc in each stitch around, join. 19-21: With colour A - ch1, sc in each stitch around, join. Weave in all loose ends and you are done! Happy hat making. So I had such great feedback from the last one I figured what the hey! 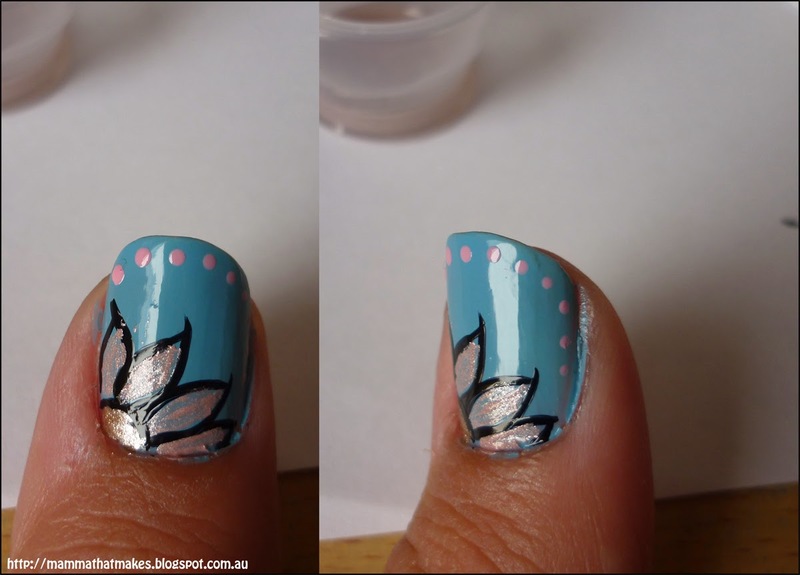 Here is another nail art tutorial. Again, super basic, because hey Im only a beginner myself. Hope you enjoy! 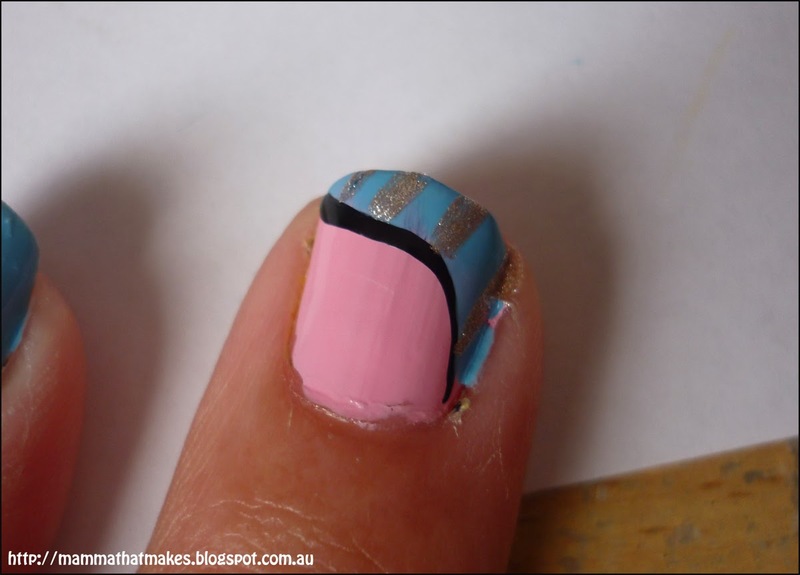 Remember to wait for the nail to completely dry before adding more parts or the top coat. For this design I used Ulta3 base coat not pictured), Seche Vite Fast dry top coat, MUD in baby blue, Diva in Cheeky, Colour Club in Antiquated and a black striper. I also used a thin brush, a thicker brush for mixing colours and a dotting tool. Put your base coat on first and wait for it to dry. 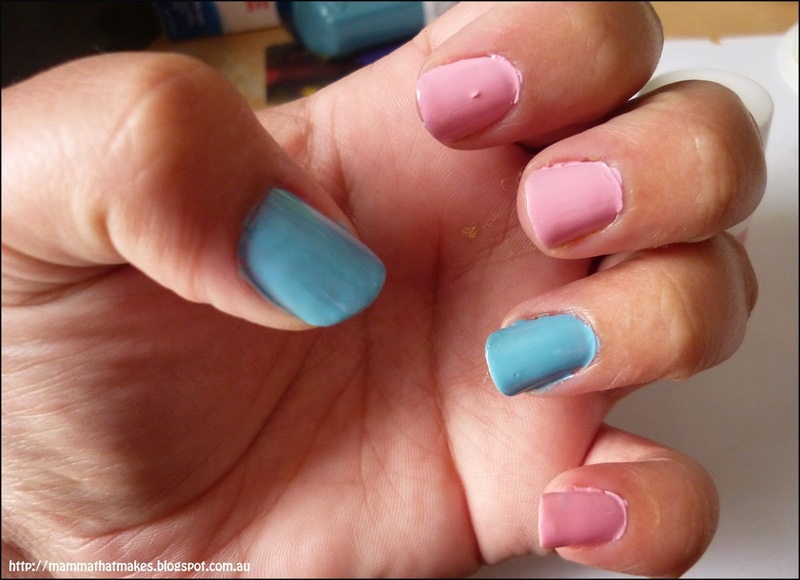 Start by painting your thumb and index finger in baby blue, and your remaining 3 fingers in cheeky. 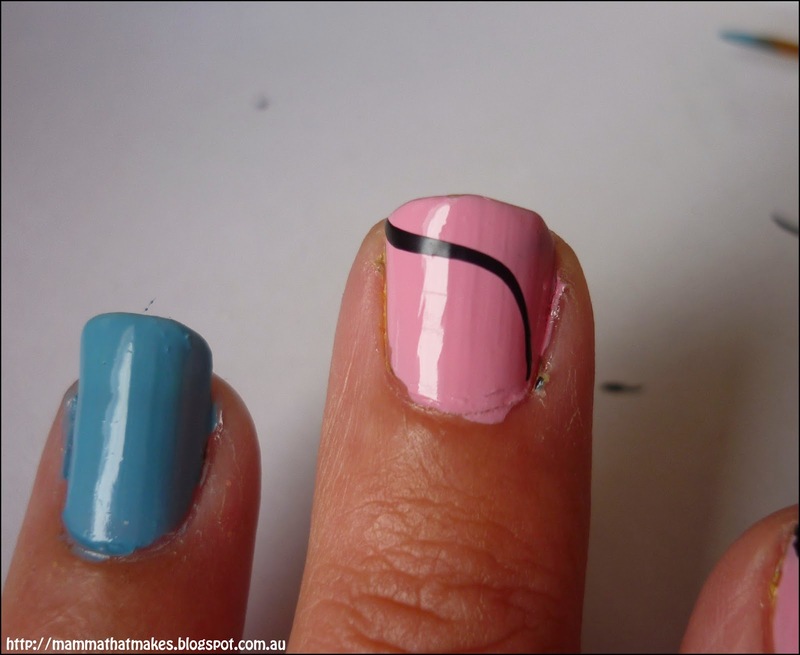 On all pink fingers, using your striping brush and black polish create wavy line that starts in the top corner of the nail and finishes down the side. Fill in the top section with baby blue. 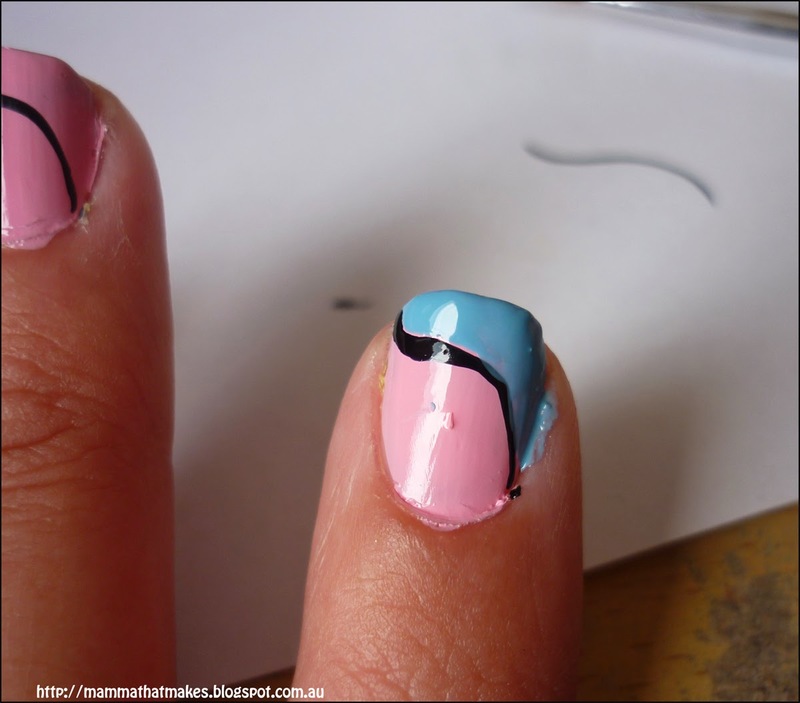 On the baby blue nails, start by painting a black arch in the bottom corner. 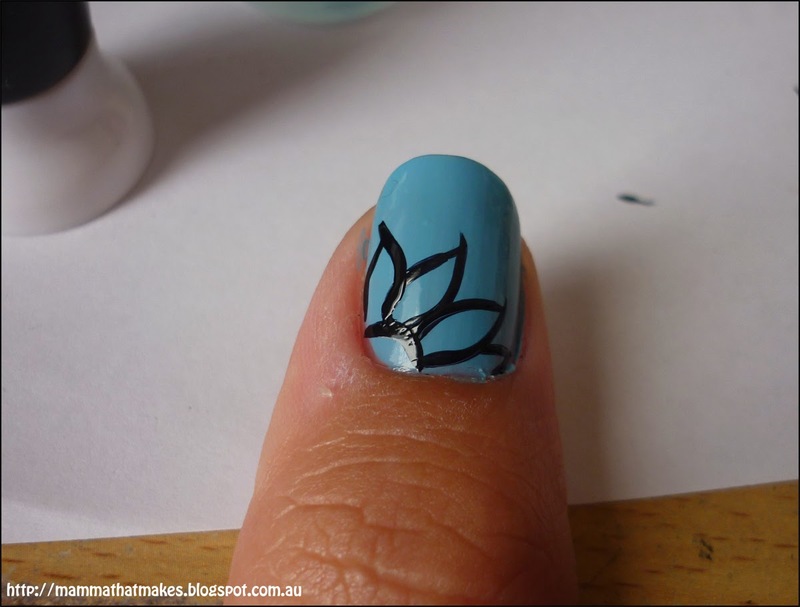 Add a third and/or fourth petal, depending on petal and nail size. Using Antiquated fill in the centre of the flower. For this colour I mixed some cheeky with some antiquated to give me a pinker shimmer. 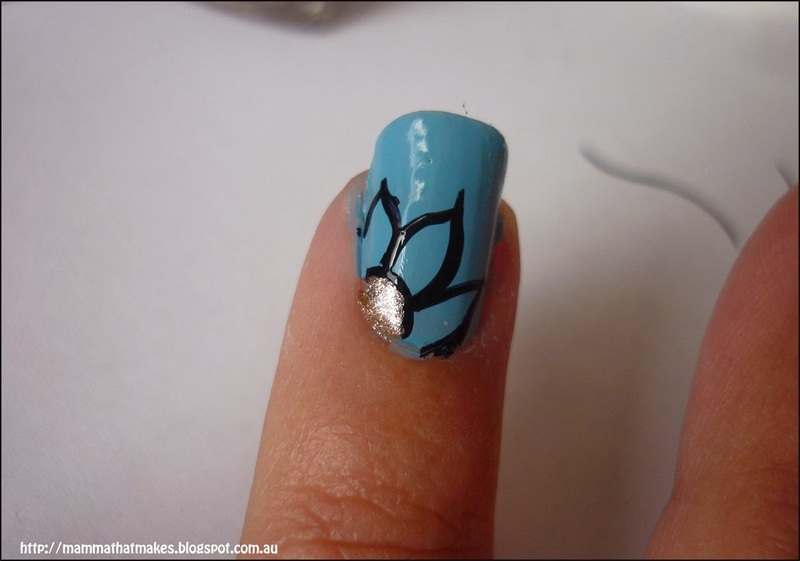 Using a dotting tool, place dots along the top of the nail and working down the side, let the dots get smaller as you go. 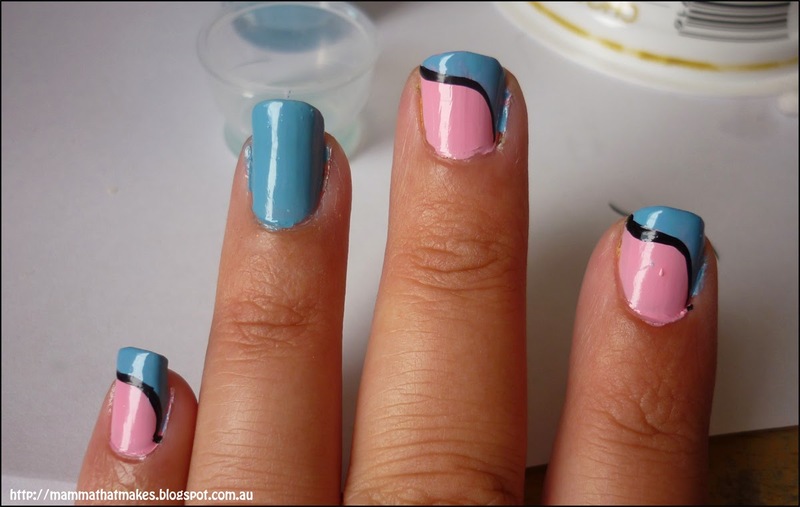 On the blue section of the pink and blue nails, use antiquated to make some stripes. 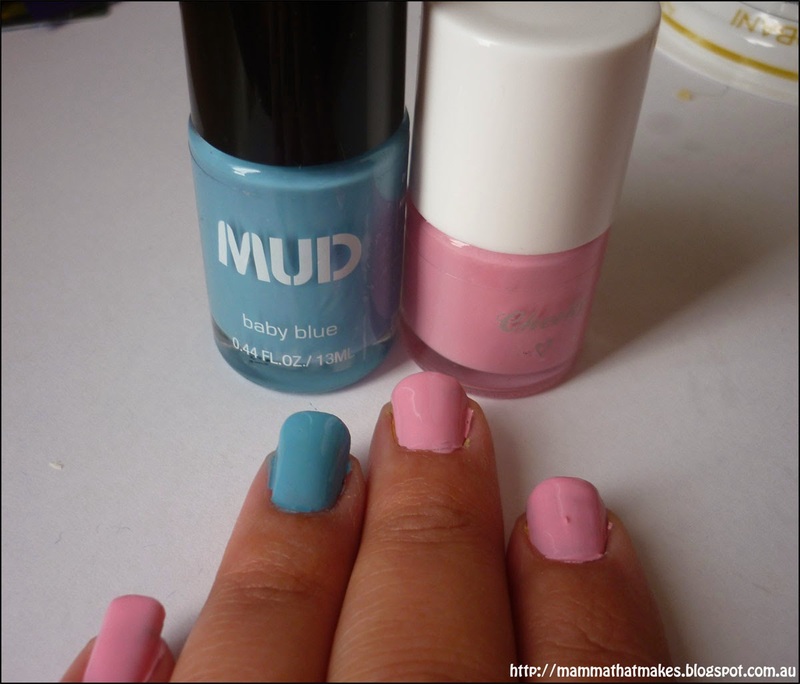 Clean up your edges and apply top coat once everything is dry. Angels for the Forgotten's annual craft challenge has kicked off again this year. I've set myself some personal goals, including making 100 hats. I'm trying for a good range of male and female styles and some unisex too, but I'm really having a hard time finding guys hats I like the looks of. So I'm just winging it! Of course winging it means you guys get some more patterns woo! This hat fits my 11yr old girl, and my partner, so I'm going to say preteen/teen/adult for the size, its got a bit of stretch to it. 1: ch2, dc 10 times into the 1st chain, join to 1st dc. 4: ch3, *2dc in the first stitch, dc in the next 2 stitches* Repeat around, join. 5: ch3, *2dc in the first stitch, dc in the next 3 stitches* Repeat around, join. 6: ch3, *2dc in the first stitch, dc in the next 4 stitches* Repeat around, join. 7-8: ch3, dc in each stitch around, join. 9: With colour B, ch2, hdc in each stitch around, join. 10: With colour C, ch3, dc in each stitch around, join. 11: With colour B, ch2, hdc in each stitch around, join. 12: With colour A, ch3, dc in each stitch around, join. 17: ch1, sc in each stitch around, join. End off here and weave in all tails. 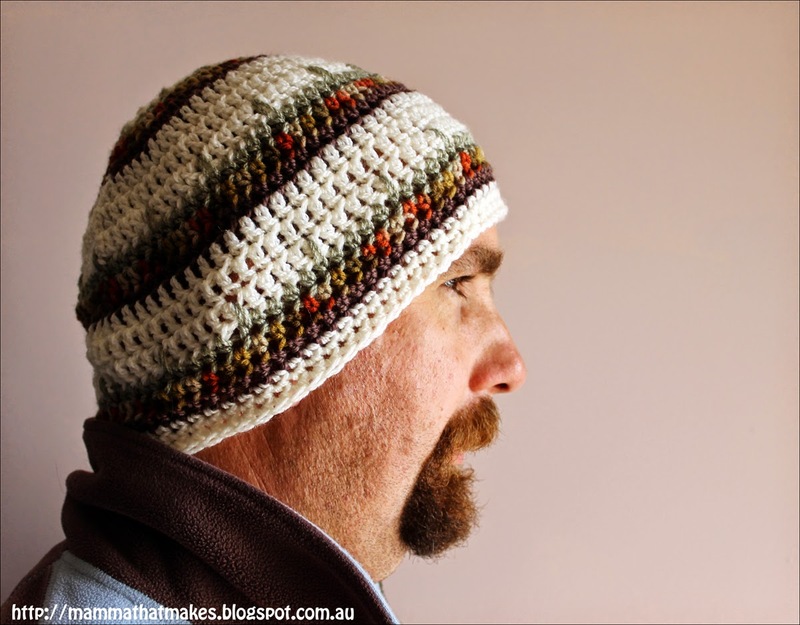 If you are after a slightly slouchier hat, repeat rows 9-12 for a third time, and for a super slouchy hat repeat for a forth. Today's pattern is nothing new. Like the small mitred blanket, its a familiar stitch, I'm just giving you instructions on how to make it prem sized (and colour ideas), as I've been asked by a lot of people if I can do just that. This blanket is approx 26x28 inches in size, or 66x71cm, and will be a great size for prems between around 24 and 34 weeks gestation. The pattern itself is an easy one line repeat, and the striping combinations are endless. DK weight yarn in 3 colours. For this pattern Purple will be colour A, White is colour B and Pink is colour C.
1: Chain 73, dc in the 4th chain from hook, *dc in the next 4 stitches, dc2tg, dc2tg, dc in the next 4 stitches, 2dc in the next stitch, 2dc in the next stitch* Repeat this across all chains. Repeat rows 2 and 3 once more. hdc evenly down the side of the blanket. When you get to the next corner hdc into it and then across the bottom of the blanket do the following stitches :ch3, dc in the first 2 stitches, hdc in the next 3 stitches, scin the next 4 stitches *hdc in the next 3, dc in the next 4, hdc in the next 3, sc in the next 4* repeat 3 more times, hdc in the next 3 stitches, dc in the next 2, (ch3, slst and sc) into the last stitch, hdc evenly up the next side and into the corner stitch, ch1 and sc into the same stitch, *hdc in the next 3 stitches, dc in the next 4 stitches, hdc in the next 3 stitches, sc in the next 4 stitches* repeat 3 times, hdc in the next 3 stitches, dc in the next 4 stitches, hdc in the next 3 stitches, sc in last, join. If you want to add another colour you could from here easily just hdc around the entire blanket as the tops and bottoms wont be so wavy now. Boy do I have some cute overload for you today! 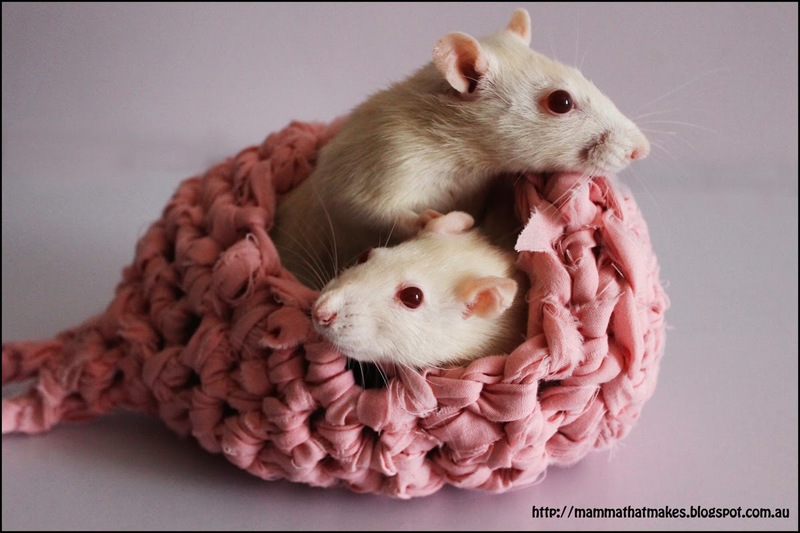 I would like to introduce to you Ozzie and Kinza, my dove hooded ratties, who are sisters and a bit over a year old now. 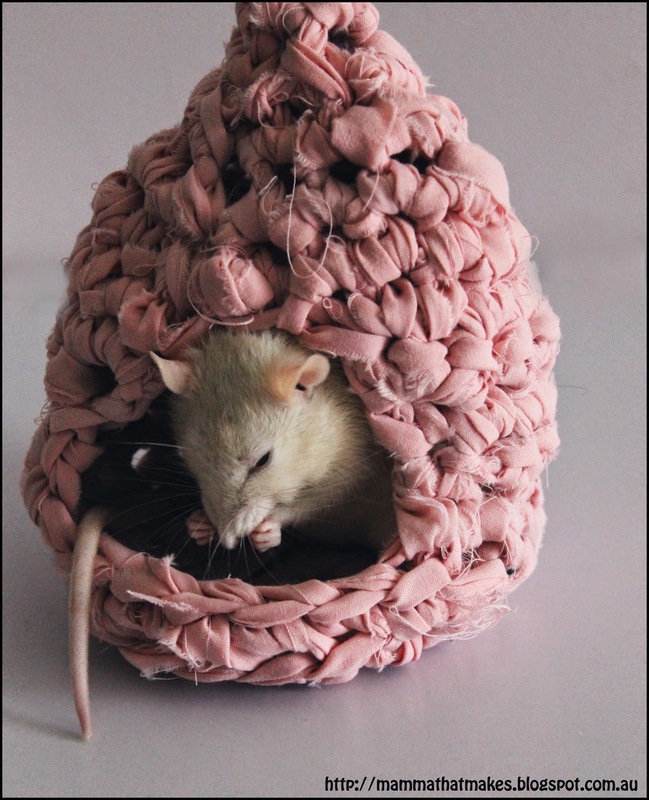 Recently I've been on a quest to find new things for their cage, and also to use up old stuff in the house. 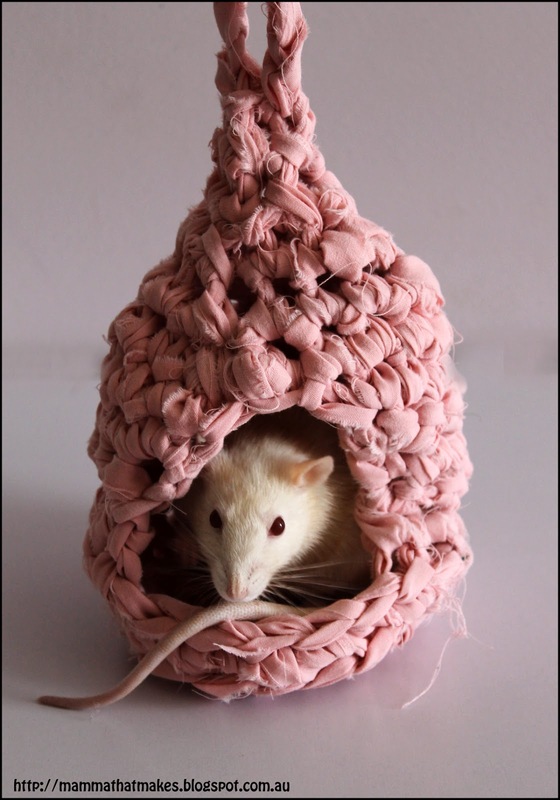 Up-cycling AND crochet, does it get any better? Aside from adding a rat right? SQUEE! So! To make your "yarn" take a bed sheet and just start ripping. 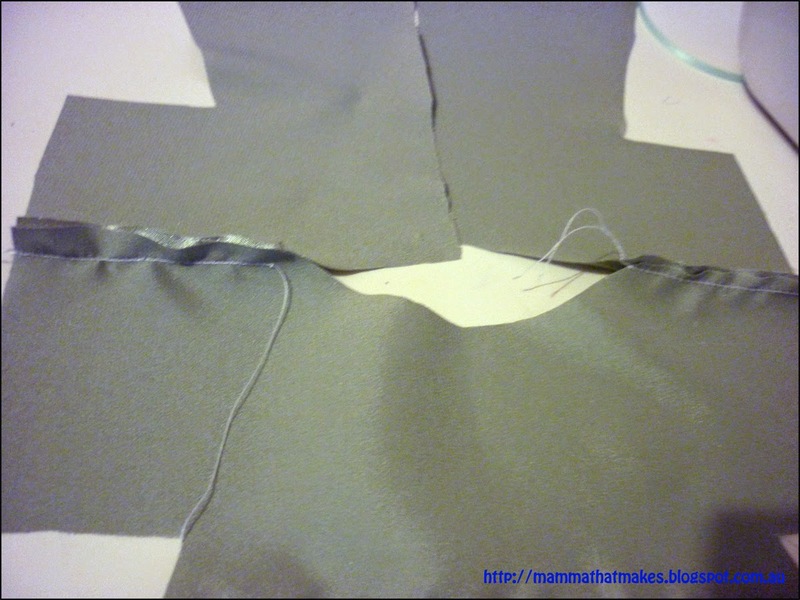 I ripped mine in one continual piece by cutting into the sheet about an inch thick, and ripping along the side until I had about an inch left, then turned the sheet, cut into it a little along the next side and ripped along that. Just keep going like that until the entire sheet is done. I wish Id thought to get a photo but it was late last night so here is a little.. visual I guess, of what I mean. Yup, amazing visual there, but you get the jist :) Roll into a ball as you go or it'll get tangled. For those of you who are not inclined to rip up a sheet, some super chunky yarn will work just as well or you can buy t-shirt yarn precut which I would love to try but given its pricetag, probably not anytime soon. You could possibly even use fleece if the strips are thin enough. Fabric Yarn. I rolled up a double bed sized sheet and only used maybe 1/4 of it. 15: sc2tg twice, chain 8, sk one sc, sl st to the next. End off and tuck in end. The best part about this is when it gets smelly, and we all know eventually it will, you can just chuck it in the washing machine, heck you could even pop it in a clothes dryer if you wanted to! The loop at the end is to hook the bed to the cage, otherwise it might topple over, not that my girls seemed to mind too much! 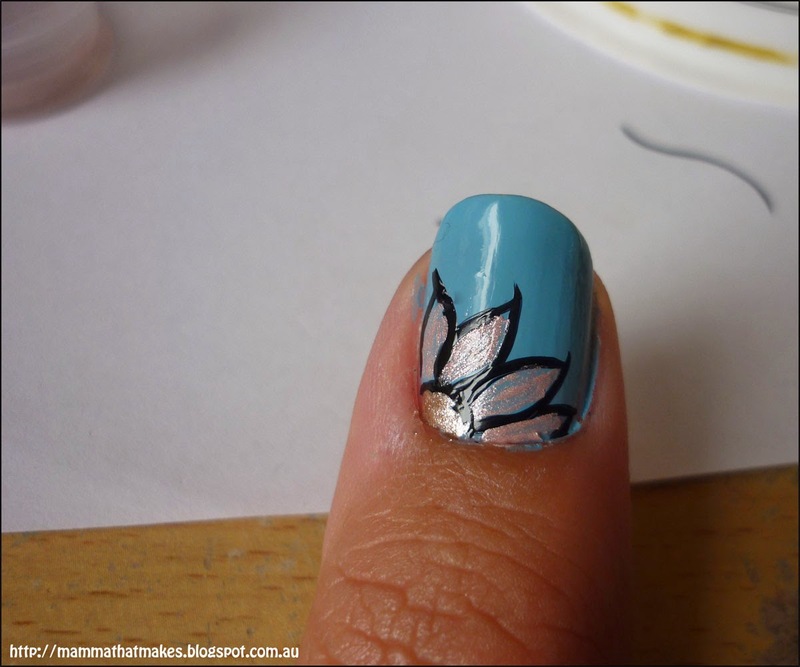 Recently I discovered the wonderful fun of nail art! I've always loved painting my nails, but to date even tho my polish collection was impressive, the most outrageous thing Id ever done is paint them all differing colours. One of my good friends posted me a box of bits to play with and I have to say, I am totally hooked. A lot of people on my facebook page have said they wish they knew how, have no idea how or cant do fun things because they are new to it all. Im here to say Nuh huh! 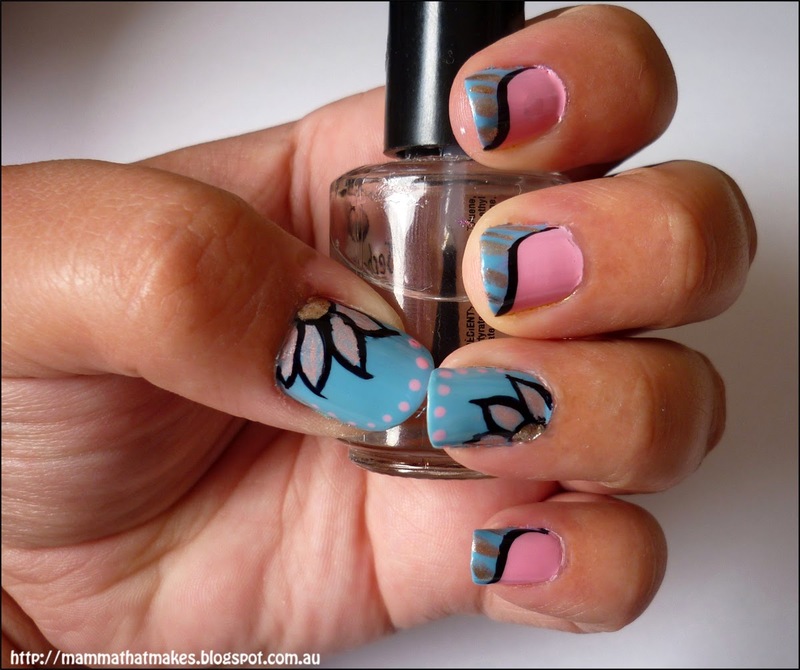 Nail art for the most part, is EASY! It just requires a little practice. I had overwhelming requests for a tutorial on the ladybirds I had on last week, and so well, here it is. The original image isnt the greatest, its the only one I took and by the time I decided to go ahead with the tutorial Id already worn them for a week and they were looking less then perfect. I really wanted to have this up earlier, but I've been out all week with a cold and haven't managed to blog a thing! If this is something people would like to see regularly, please let me know. I'm more then happy to add up my designs when I do them. They won't be anything amazingly awesome, because hello, beginner here, but you know me, firm believer in sharing knowledge regardless of skill level. Everyone can learn from someone else! Start with a base coat. I used Ulta3 for this. Do one coat of white, this will help your green pop if it isnt quite opaque enough. I used BYS white from the white/red duo, which I picked up in Kmart for 50 cents! Bargain! One coat of green. I used Ulta3's Tahitian lime. I didn't have a pastel green colour, so I mixed some of the Tahitian lime with a little white to make one. We'll be using this for the leaf veins. 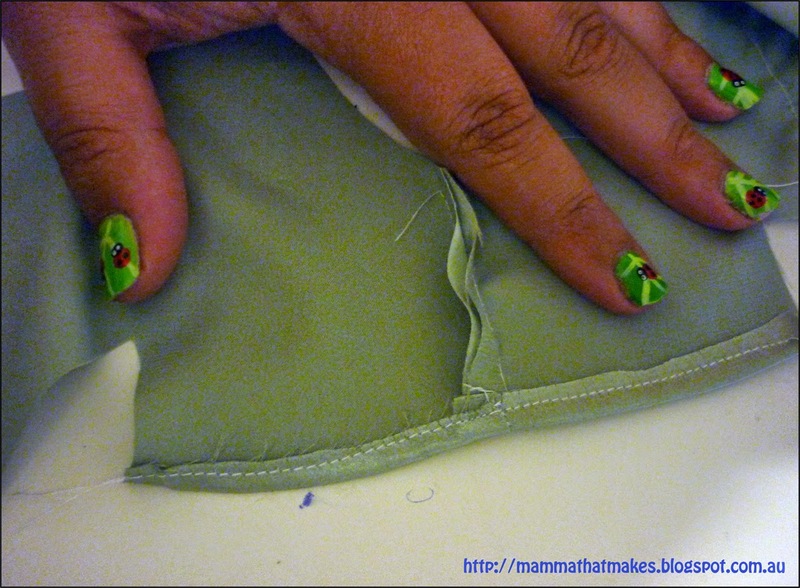 Using your brush and the green we just mixed paint on one stripe across your nail, for the leaves main vein. I used different directions on each nail. 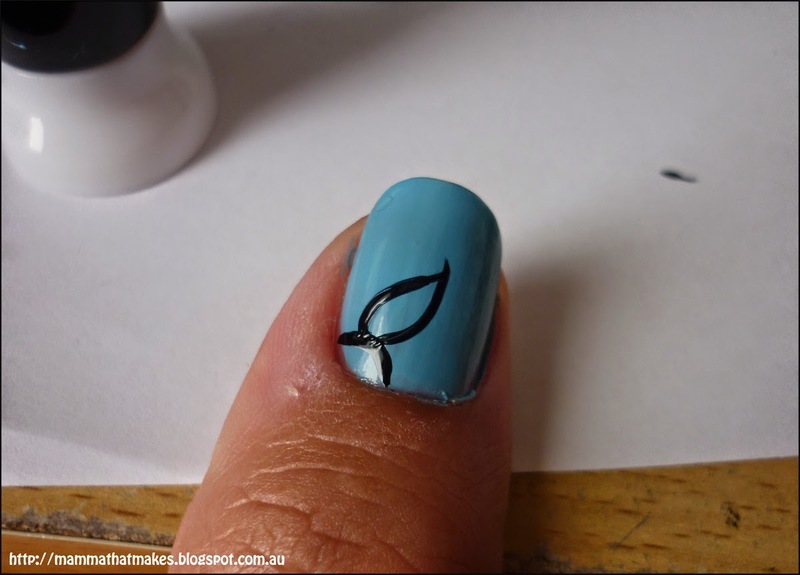 Add the rest of the leaf veins using your brush, starting from the middle line and dragging the brush outwards. Add a large red dot for the ladybugs body. I actually just dotted this on with the end of the brush. The red I used has a glittery look to it, and is a Revlon polish, but the bottle is so worn there are no other details. Its one Ive had since I was a teen. Using the larger end of the dotting tool add the head with black. I did 2 dots super close to each other and used the end of the tool to join them. Using the smaller end of the dotting tool put some little black spots on the ladybug. I did 4 on some, and 3 on others, depending on how big its body was. Using white, dot on the eyes with the smaller end of the dotting tool. Now, rather then trying to re-dot again with an even smaller black, I found if I pushed the white dots on with a little force then when I lifted it up, the black from the layer below showed through in the very centre of the white dot. 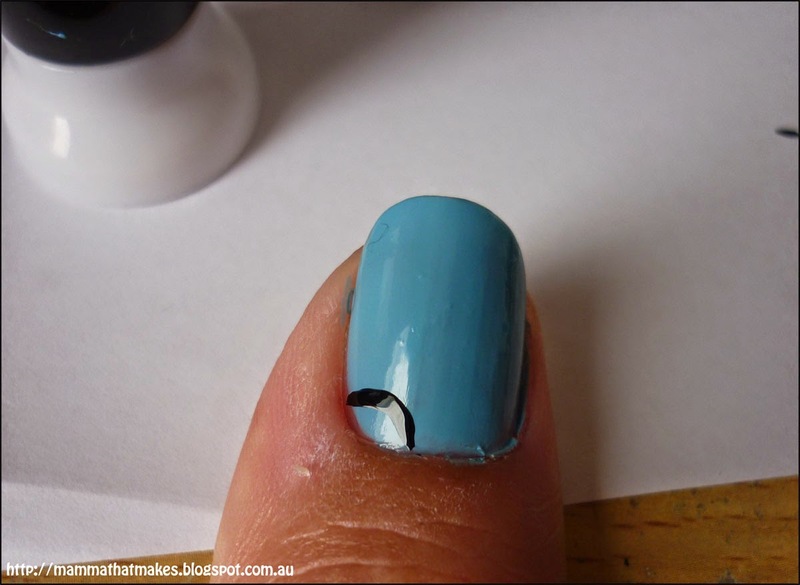 Of course you could also gently add black dots to the top if you have a small enough tool or toothpick. Then just a top coat once its all dried. For that I used Seche Vite Fast dry top coat which I love! Then just give them a bit of a clean up with a cotton bud or remover pen, or even a brush in polish remover, whichever way you like to roll. 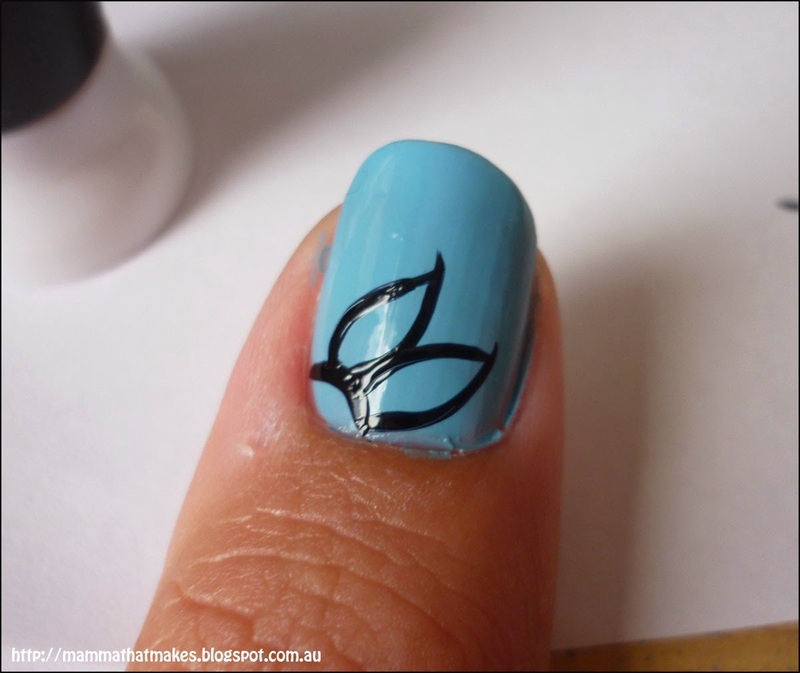 Thats it, repeat for the rest of your nails. Told you it was easy! Today I have something a little different for you all. Lately Ive been browsing burial gowns trying to find a pattern that was simple and easy and free. One that opened at the back, didn't involve an overlocker and didn't have these tiny little arm holes which I am sure would be a pain to actually use. So, I sat down and drafted my own up. Like Ive said in previous sewing tutorials, I am in no way, shape or form amazing at sewing. I am self taught and my method is to throw some stuff around and hope for the best. 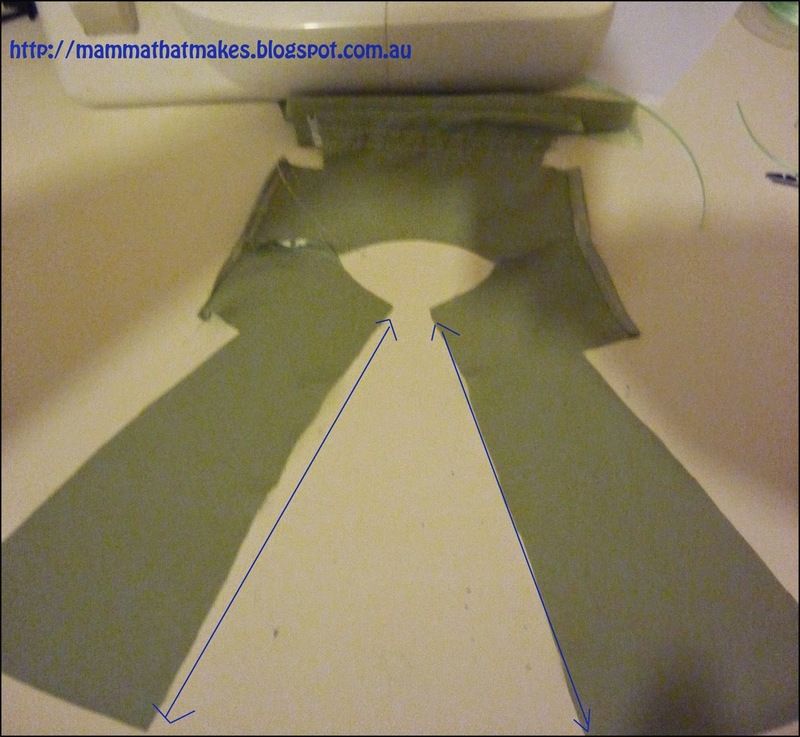 So, this pattern may not be outstanding, and it may not be as amazing as some I have seen recently, but it IS simple, easy, fast and lets face it, if I can put it together, anyone can! and most importantly its free! It is also very easy to customise. It features an open back, and has wide sleeves which will make putting on baby so much easier. The doll I have it on is 24 weeks gestation, so Id say it will fit around 22-26 weeks give or take. Again, very simple to make it larger. Some fabric. I have used cotttons, flannels and satins so far all with success. Scissors, thread, pins and of course a sewing machine. You can access the pattern HERE Print it to fit on an a4 sheet of paper. 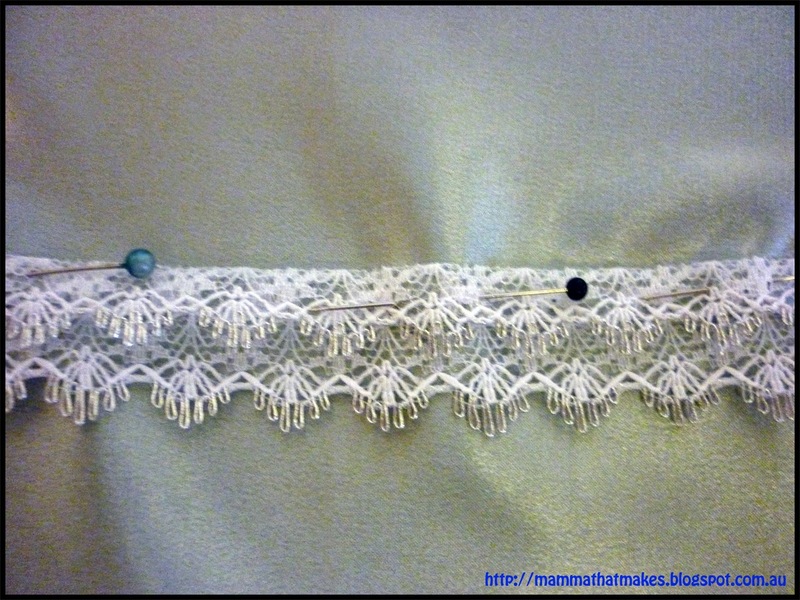 Pin the decorative ribbon or lace trim to the front of the gown and stitch it on. As you can see, I folded my piece in half first, as I thought it looked better then the single strand. 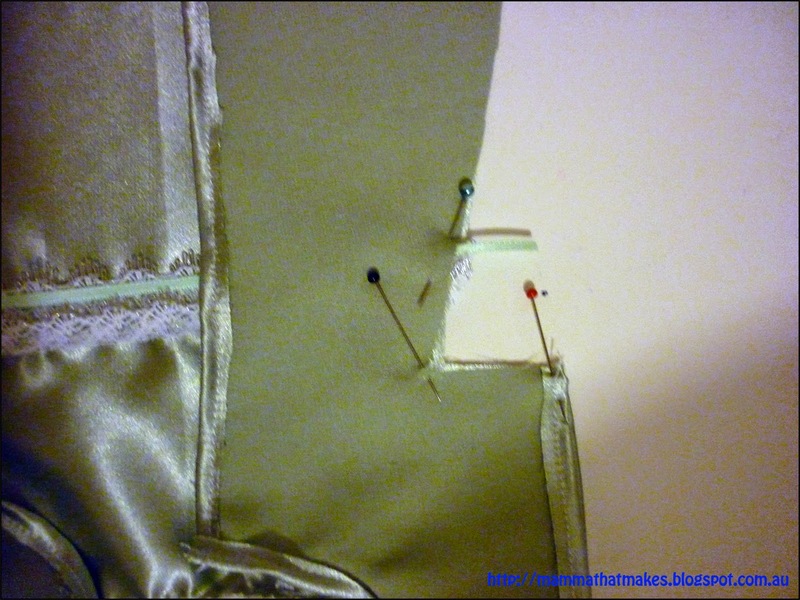 Next, with right sides facing, sew the back and front pieces together at the shoulder seams. Hem the edge of the sleeves. 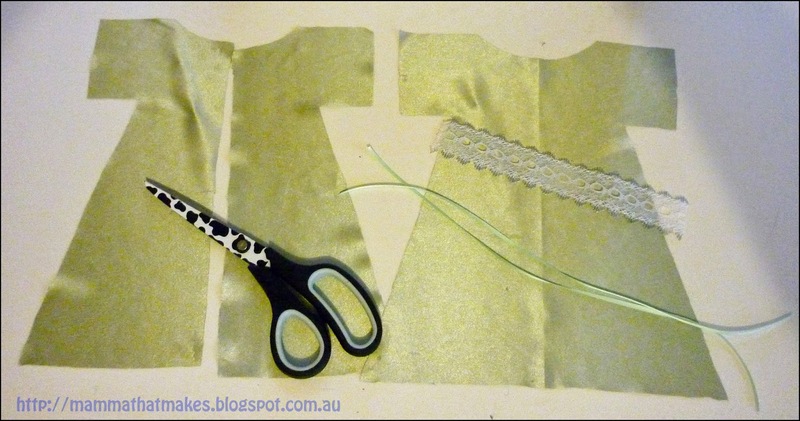 With the right sides together, pin the ribbon ties in place, with the majority of the ribbon facing inwards, then just sew up the sides of the gown. 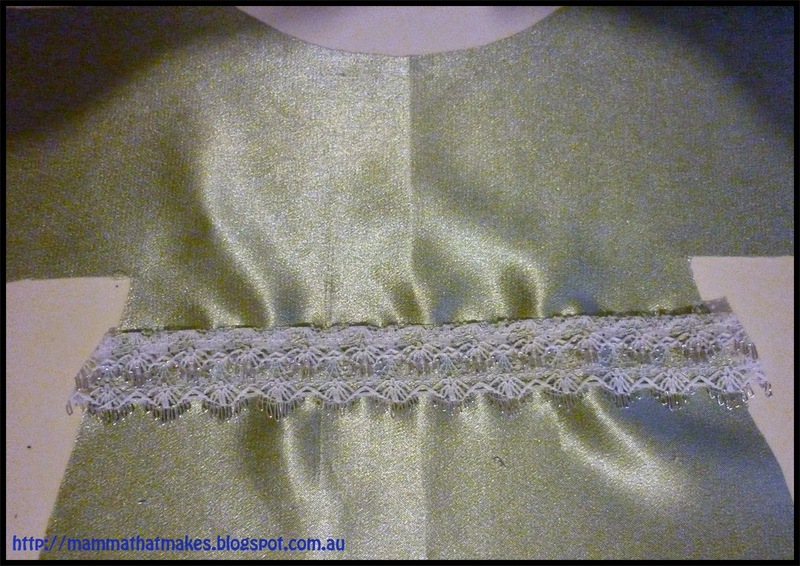 The last step is to hem the bottom of the gown and that's it, your done! Told you it was simple. I'll be adding photos of the ones I make on my FaceBook Page so if you want to see what materials/colours/trims ect I use by all means pop on over and have a look. I hope this helps everyone that was looking for a free and easy sewing pattern. If you have any questions I'll try my best to answer them, but like I said before, Im not terribly great at sewing and if you have a better way of doing this by all means. Also, if I had a pair of pinking shears Id have used them for all the edges to stop any fraying. Unfortunately I don't own a pair, nor do I have an overlocker (serger) but if you do, then I'd go with them to make the job a little neater and easier.